Cody 14's Story . . .
Cody has settled right into his foster home with no issues. He's a very calm guy for only being five years old. He doesn't bark excessively, isn't destructive, and has been totally reliable in the house while his foster parents are at work. His usual greeting is a lot of wiggling and then, once he's greeted, he usually sits or lies near whoever he’s with. His foster family acquired a semi-permanent foster cat about a week after Cody came to stay, and while the cat is in its cat condo, he doesn't harass it or bother with it. If the cat is free in the house, he wants to pursue and trap it. Health-wise, Cody has completed a month of meds for his positive Ehrlichia test. He will be due for retesting in six months to a year. 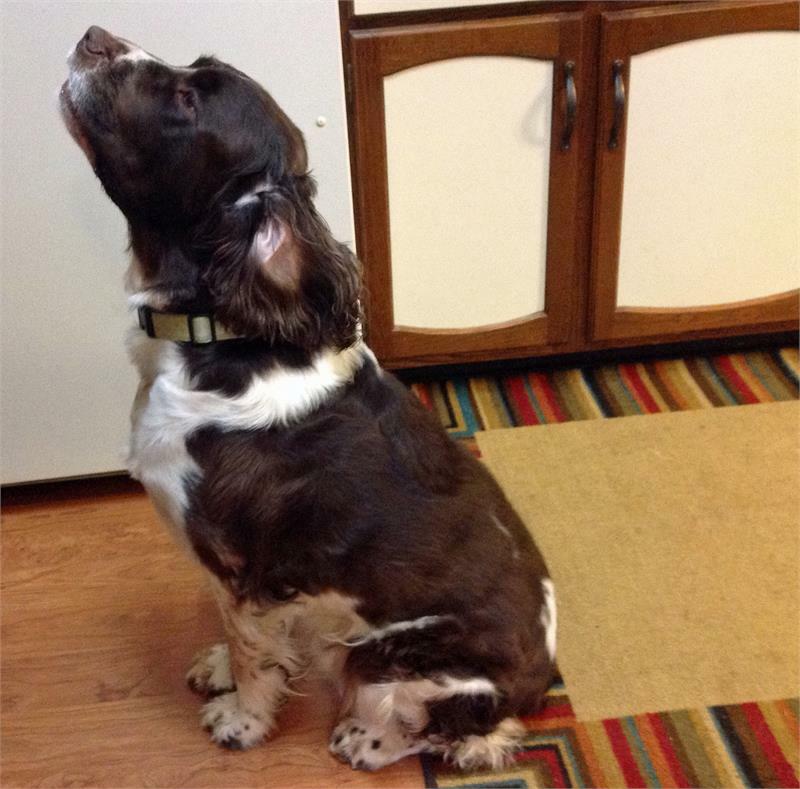 He came to his foster family on a grain-free kibble and on an allergy medication. His foster family has found that while he periodically has a licking spell, he isn't an incessant licker and did not increase his licking when the allergy medicine was stopped. A small patch of skin on his left hind leg that has an area of skin eruptions has been evaluated and is being treated with a topical spray that combines a steroid and antibacterial. No exact diagnosis has been offered for this other than its being an inflammatory process which seems to be slowly improving with use of the spray. It has never seemed to bother Cody and was only detected by feel under his fur. His foster parents have bathed him and scissor trimmed his feet fur; he tolerated both well. No counter-surfing for this dude, although he might not be above temptation if he were left totally alone with something really desirable. He will take unattended used paper products (napkins, Kleenex, paper towels) to shred and eat but has not bothered garbage cans with lids. He has slept on the bed with the college age son of the foster family by invitation, and tries to get himself invited to his foster parents’ bed. But, good boy that he is, he respects the "no" and "off" commands and retires to his dog bed beside his foster parents. 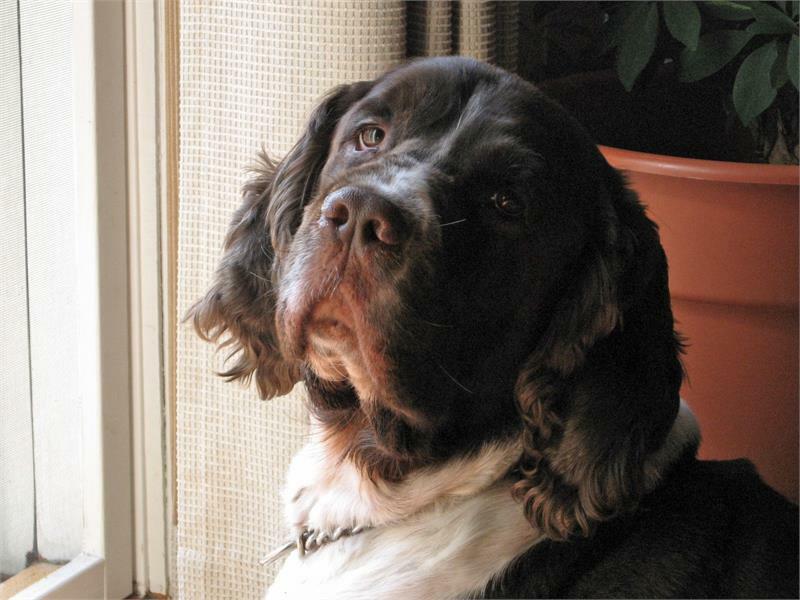 Mr. Cody has a very deep resonate bark that he uses when the doorbell rings, someone knocks, or when he doesn't recognize who or what is approaching (such as strollers, filled leaf bags along the side of the road or an unknown person walking up the driveway). Once he's accompanied to the “strange” object or the person is greeted by his foster family, he's all ready to either ignore the new object or, in the case of people, give them his sit and wiggle. This handsome fella gets loved on by the neighborhood elementary girls waiting for their school ride. They’re dog-savvy and not fussy about drool...Cody’s kind of people!! He's been calm and friendly with everyone (all adults) who has come to the home. He will ignore some dogs (usually smaller, or stationary) while on his walks, but barks and jumps at others. He hasn't met any other dogs off leash. Cody walks very nicely (in Springer zig-zag) on a leash using an easy walk harness. He waits politely while his foster mother chats with neighbors. His only weakness (or strength, if perhaps one hunts) is his game instinct. He loves to spend the walk with his nose down scenting, bobbing up periodically to scan for squirrel, bunny, and sometimes bird movement. On a hike Thanksgiving weekend, Cody spotted a porcupine before anyone else; fortunately, his foster dad was quick with the leash, averting any potential bad outcome! The harness does a good job of checking his “0 to 60” launch when he sees game, but his human walker still wouldn't want to be taken by surprise and is wise to pay attention. Cody does not have reliable recall. Since their yard has no fence, his foster family takes him for an around the neighborhood walk before leaving for work, a long walk in the evening, and sometimes a shorter walk again. Cody has occasionally enjoyed playing with a stuffed chew toy that's thrown for him in the house, bringing it back, and "giving" with not too much encouragement. He's shown no interest in tennis balls, Frisbees or Kongs. Cody’s Christmas wishes include, naturally, a forever home to call his own, a fenced yard and a spot to chase those furry varmints. He would love any people who came as part of his family; he’s not too sure if a feline critter or other dogs should be included. What fun some lucky folks will have running with him through the snow this winter. Cody’s a dog for all seasons! Cody was a Jersey guy whose parents were going through a divorce. Mom had no room for this love in her small apartment and Dad had four other dogs. 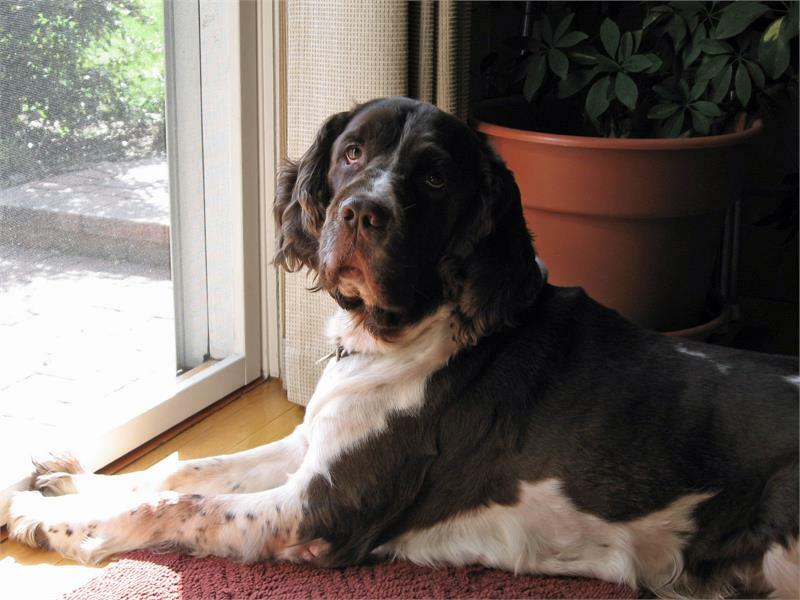 And, so, Cody found his way to a loving and comfortable MAESSR foster home across the river in Pennsylvania. 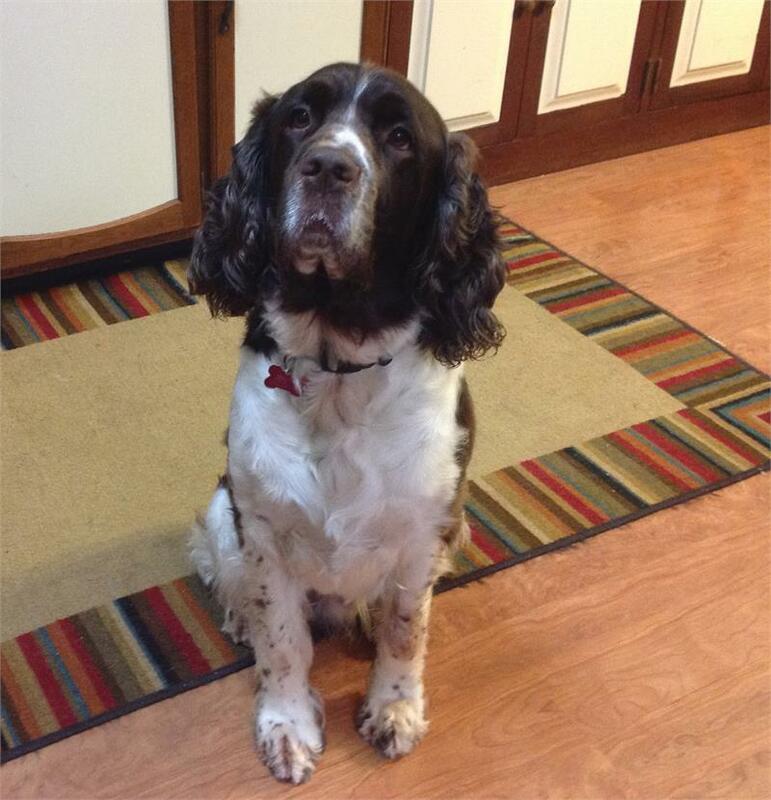 Cody has been with his foster family a week and is a good-natured, energetic young dog. He has been friendly and enthusiastic with everyone he has met. While no children live in his foster home, he has met elementary age children at bus stops in the neighborhood and been friendly and appreciative of well-behaved greetings from all the children. When his foster mother stops to greet neighbors, he also greets nicely and waits well, often just sitting calmly--unless there's a squirrel, or rabbit, or chipmunk. Then, he'd like to get it RIGHT NOW. This fellow is big Springer and pulls when starting out on a walk. He does settle down for the most part, doing a Springer zig-zag walk. His foster family uses an "easy walk" harness that significantly curbs the brunt of pulling. Indoors, handsome has generally very nice house manners. 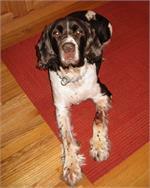 He is a typical Velcro Springer and wants to be where the people are in the house. He showed no interest in the big wire crate with a dog bed in it. Even though a kong filled with liver treats and sealed with peanut butter was just left in the open crate the whole week, he did not go in to get it. For the first week he was gated in the TV/sunroom without being crated. He respected the gate and was completely well-behaved. Then, however, one day his foster family returned from work to find the gate knocked over and Smartypants greeting them happily at the door. He had not been destructive while loose in the house although it did appear someone had been napping on beds—he and Goldilocks would get along just fine! Cody has not counter-surfed, but probably shouldn’t be trusted unattended with treats on the counters—hey, a dog’s gotta do what a dog’s gotta do! He's very interested while food preparation is happening, but goes and lies down while the family is eating. He's a casual eater but has no competition in his foster home. He is fed twice a day and usually finishes both helpings over the course of the day. He is a loud and sloppy drinker who needs a face wipe when he comes up for air. His foster family’s main trash cans have lids which he hasn't bothered—good boy!! Small, open bathroom trash cans with tissues and q-tips are irresistible as are napkins fallen to the floor. A few were retrieved from Cody's gullet the first day or so. He tolerates such handling well. Similarly, his foster mother has trimmed his foot fur and cleaned his ears with minimal fuss. He needed a team boost into the tub with a treat lure when he had a bath, but, once in, stood fairly calmly with just a couple attempts at escape. Cody’s never nasty, just resistant. He was also calm and well-behaved during his vet exam. 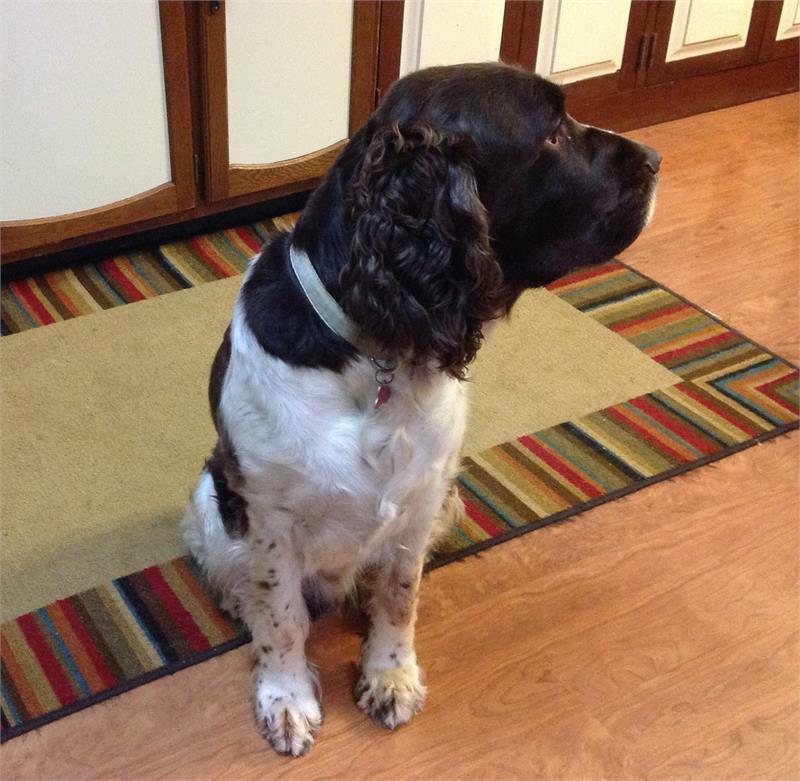 Typical Springer, he has some skin itchiness, will periodically lick on his paws and has a small bare lick spot on a paw as well as a calloused front elbow. The vet did not think either required intervention other than a medicated shampoo and OTC allergy medication. Cody has shown no resource guarding with humans in the home who can easily remove items from his mouth--food, toys and tissues. No other dogs are in the home so his reaction to a roommate is unknown. Sometimes, he has barked at other dogs on a walk, but other times has walked right by them. And then there are those other furry critters. No cats were in the home when big guy arrived, but now a cat is in the wire crate gated off from the house core. Cody is interested, has barked at it when his foster mother goes out to tend it, but does not spend time trying to get at it when the people aren't out there. He has settled on the couch with his foster dad while his foster mom held the cat on a chair. If loose, he would likely chase it at first, but would maybe learn to co-exist. Overall, Cody is a sweet and charming guy who could easily fit into about any household ready to give him lots of love and exercise. Remember, he would really like to get at those small critters that roam around outside and would definitely enjoy a fenced yard in which he could chase and chase and chase. Wouldn’t you like to see Cody in your yard playing with the leaves this fall? He is indeed a love who will add much to a home.